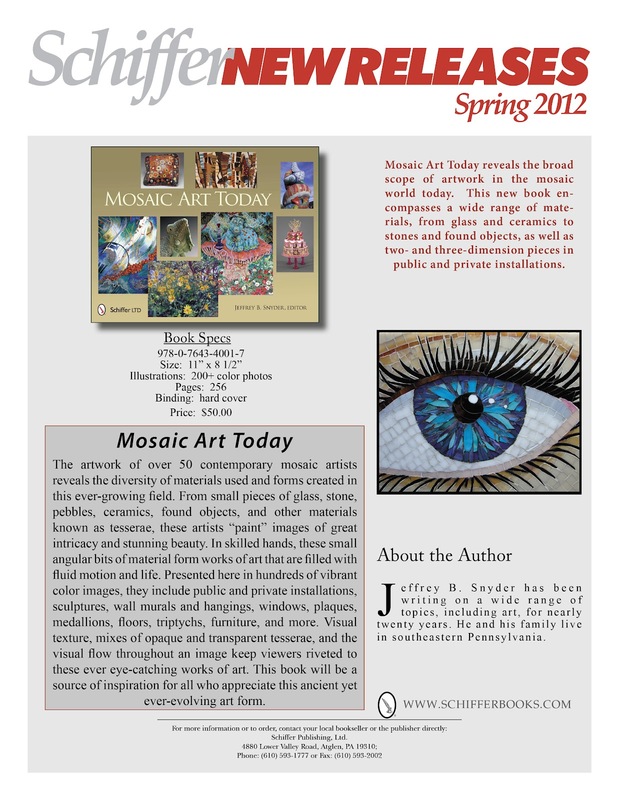 I submitted for this mosaic book about 18 months ago and was notified in Jan or Feb that my work would be included. I wasn't quite sure what to expect, but knew that at the very least I would have one photo and name recognition. I have been waiting very patiently for it to arrive, and ordered an extra for my parents. When the UPS man came today I told him what I was waiting for--- usually he lugs large heavy boxes full of tile to my garage. He was surprised and curious too, so he helped me open the stubborn taped box right on the porch. To my delight, a photo of my "Currently Nesting" is on the back cover (along with a few other works), and I have a 6 page spread. Just me and my mosaics. 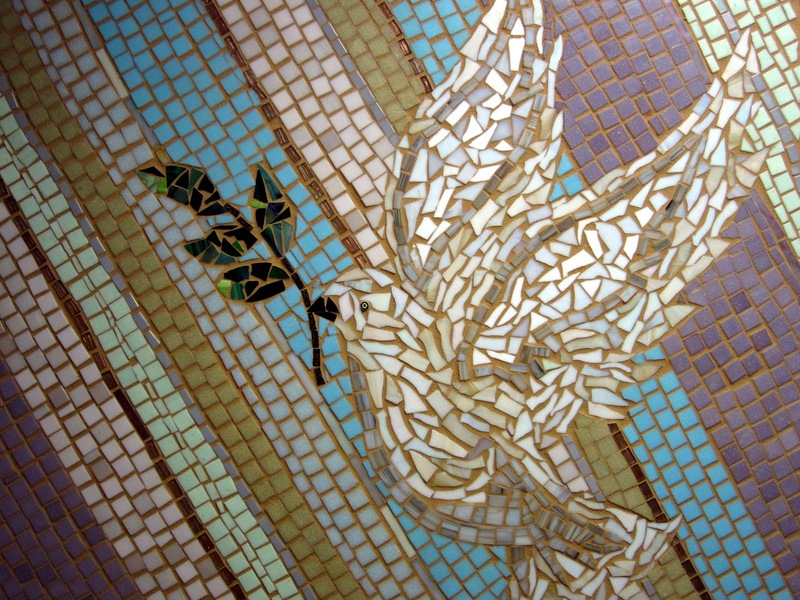 The book is layed out by artist, easy to read with big beautiful photos of mosaics. This is not a crafty how-to book, this is a full fledged coffee table art book. Wow. 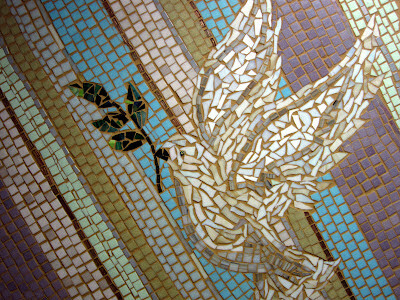 If you love mosaics, and are curious what is being created in this ever changing medium, this book will not disappoint. Even the UPS man was impressed. 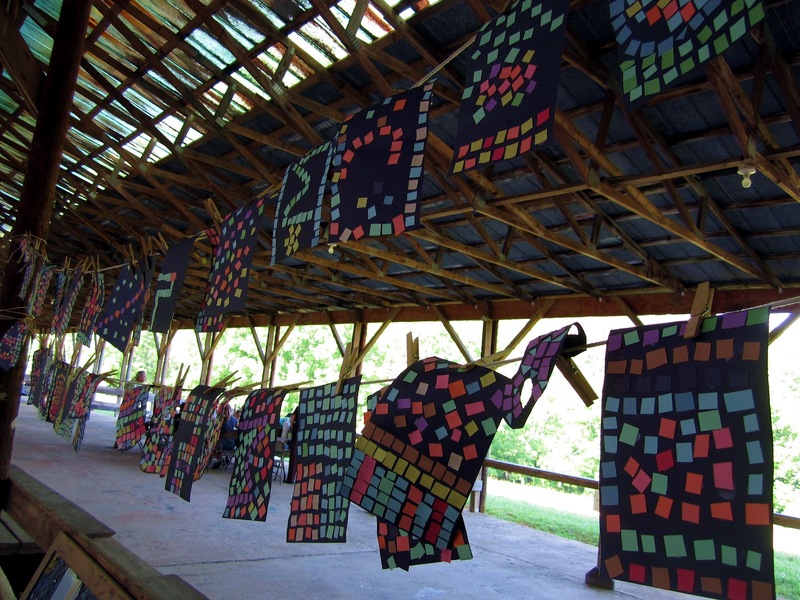 I just got back from another incredible week at the John C Campbell Folk School in Western NC. It was a very special week called "Little Middle", one of two weeks per year when kids have classes on campus. 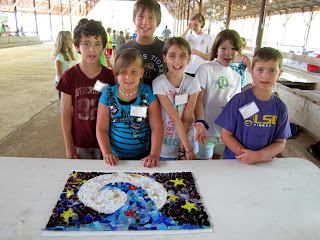 This was my third time teaching mosaics to "littles" ages 7-11. The thing that always strikes me during this week is how uninhibited kids are in the creative process. Most times, they are unaware of the things they CAN'T do, and just go for it. We start with paper mosaics, then small individual projects, and group activities, then build up to collaborative grand finale mosaics for the last 2 days. This year each group of 6 kids had to brainstorm, make design decisions, draw a pattern, create a mosaic with pre-cut and tumbled stained glass pieces glued to plexiglass. We talked about how ancient mosaic were made thousands of years ago out of stone. Each of the 48 kids were able to learn how to safely use wheeled nippers to cut tile to specific shapes (eye protection is the first rule). They worked on both individual projects and group projects. 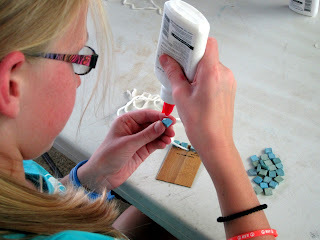 They used several different materials and adhesives. Learned 48 names, cooled off with misting spray, and had a great week together. 4x4' glass mosaic with/for Delrayno Baptist Church VBS program. About 50 participants, age range 3-83! What a wonderful project with those folks! Outdoor installations have many challenges. But a week like this, in a location like this, with weather like this, is heaven. 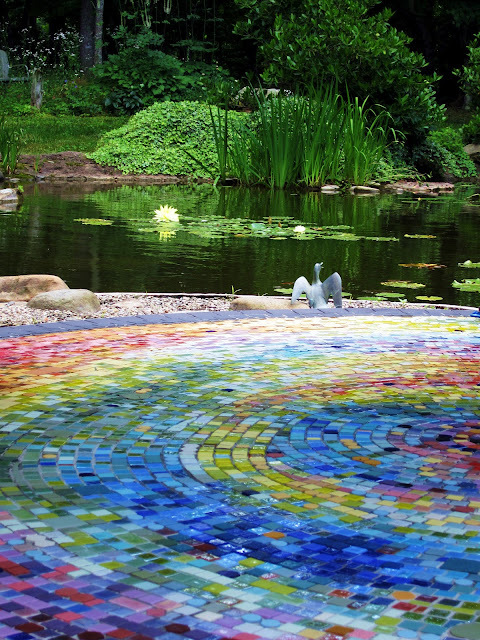 Installation has commenced on the gazebo mosaic floor. I started Saturday, couldn't believe the perfect temps and lovely breeze. Got both borders and trim, plus a few extra sections, then tarped it overnight. This morning when I lifted the tarp, there was a visitor checking out my work. I think he/she was pleased.